The right one is made without any saturated fats, the nasty artificial additives which help preserve the peanut butter, but which will make its victims feel ill after two or three spoonfuls. No, you want one which will means you can eat a half jar, and come away with a mild bloat, but otherwise unscathed. 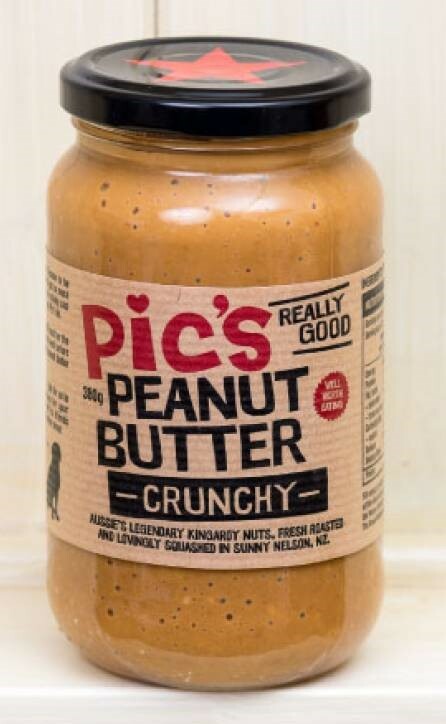 One of those is New Zealand’s own Pic’s peanut brand**. OK, it uses Aussie peanuts, but everything else is brewed in New Zealand. All natural ingredients, tastes beautiful, and edible by the jar-full, for those of us with little self-control. Mercifully, that lapse won’t leave you wallowing in regret. Of course, we don’t advise this without seeking prior medical advice. No, a much more healthy full-meal choice might be a few spoonsfuls of this stuff, with plenty of greens or a salad on the side, a perhaps one or two mashed potatoes. There you have it, a fully rounded meal. I must try it. ** Ingredients per 100g: 30g protein, 7.7g dietary fibre, 9.6g Carbohydrates, 200Mg sodium, 2470kJ, 48.4g fat, 6.3g saturated fat. ( Compare with raw peanuts 6 – 7 % saturated fat. i.e. there’s been no saturated fat USED or added in making the peanut butter ).